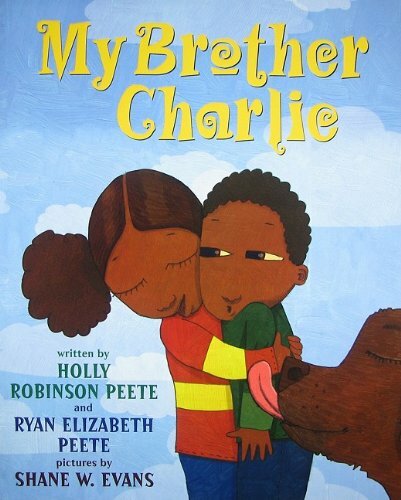 My Brother Charlie (Scholastic Press), written by Holly Robinson Peete and Ryan Elizabeth Peete, with illustrations by Shane W. Evans, is a heartwarming story of patience, love and acceptance. Young Callie and Charlie are twins with a lot in common – curly hair and brown eyes, a love for chocolate with marshmallows, music and football. But they aren’t exactly the same. Charlie has autism. Even though Charlie is different, Callie is very proud of her brother. He’s good at many things. He swims, runs fast, plays the piano. He has a special way with animals, especially their big brown dog, Harriett. Told from Callie’s point of view, it’s the story of a family who learns importance lessons about togetherness, hope, tolerance and love. The story is well told with sensitivity to the subject matter and illustrated with bold and colorful illustrations. Brings a tear to the eye. I’m glad to see a picture book on the subject. I recommend Anything but Typical by Nora Raleigh Baskin. Great post! Looks like a wonderful book. Good to hear about a celebrity book that is well done.